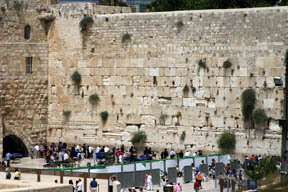 The Western Wall, also known as the Wailing Wall, is the remains of a retaining wall that encompassed part of the grounds of the second Temple. The Babylonians destroyed the first Temple, which is often called the Temple of Solomon, about 2600 years ago. The second Temple was built after the Jews returned from their exile in Babylon about 2500 years ago. Initially it was a modest Temple but about five centuries later, King Herod the Great, who was appointed king over the land of Israel by the Romans, whose empire included Israel, rebuilt the second Temple in a much more grandiose fashion. The great Herodian stones rest one on top of another without cement between them to hold them in place. Although the Wall is high, more than half of the Wall is below the present day ground level. Access to the Wall was forbidden from 1948 to 1967, when Jordan controlled Jerusalem. But after the Six Day War of 1967, Israel took control of the area, and the Wall is now open to the public. It has become a meeting place for communal prayers and many public celebrations. The Western Wall is never deserted. At any time day or night, there are Jews there, standing in front of the Wall, in devout prayer, or placing written messages on paper into the crevices between the stones.